Our friend AMK from Bali always have a new kind of food to give to us, whenever he is coming to Jakarta/ Bandung or whenever we are visiting him in Bali. And usually what he give us is the better option of food compared with what the famous one we usually bought. 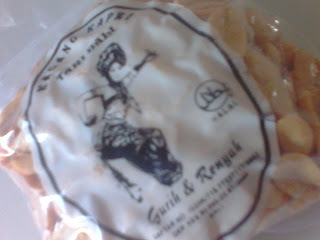 This goes with this Kacang Kapri snack (a local traditional fried peanut from Bali). He brought us this Kacang Kapri and we go nuts! It tasted sweet, savory, and better compared with the ones we usually find in Bali. He really knows how to make us come back to Bali regularly :).